American intercontinental ballistic missile. Rocket used both as a space launcher and ICBM. Status: Retired 1967. First Launch: 1959-04-14. Last Launch: 1967-11-07. Number: 135 . Payload: 1,400 kg (3,000 lb). Thrust: 1,629.00 kN (366,213 lbf). Gross mass: 119,000 kg (262,000 lb). Height: 25.15 m (82.51 ft). Diameter: 3.05 m (10.00 ft). Span: 4.88 m (16.01 ft). Apogee: 300 km (180 mi). LEO Payload: 1,400 kg (3,000 lb) to a 300 km orbit at 28.00 degrees. Initial Operational Capability: 1959. Stage 0. 1 x Atlas MA-2. Gross Mass: 3,050 kg (6,720 lb). Empty Mass: 3,050 kg (6,720 lb). Thrust (vac): 1,517.422 kN (341,130 lbf). Isp: 282 sec. Burn time: 135 sec. Isp(sl): 248 sec. Diameter: 4.90 m (16.00 ft). Span: 4.90 m (16.00 ft).Propellants: Lox/Kerosene. No Engines: 2. Engine: XLR-89-5. Status: Out of Production. Stage 1. 1 x Atlas D. Gross Mass: 113,050 kg (249,230 lb). Empty Mass: 2,347 kg (5,174 lb). Thrust (vac): 363.218 kN (81,655 lbf). Isp: 309 sec. Burn time: 303 sec. Isp(sl): 215 sec. Diameter: 3.05 m (10.00 ft). Span: 4.90 m (16.00 ft). Length: 21.20 m (69.50 ft). Propellants: Lox/Kerosene. No Engines: 1. Engine: XLR-105-5. Status: Out of Production. In July 1959, the XSM-65D prototype of the initial production variant, the Atlas D, first flew. On 31 October 1959, the first U.S. Air Force ICBM squadron went on Combat Alert at Vandenberg AFB, with 3 SM-65D missiles on unprotected open launch pads. To give the Atlas at least some sort of protection, the follow-on bases were equipped with "coffins" to store the missiles. This coffin was a blast-protected building in which the Atlas was stored horizontally. Following the launch order, the roof of the coffin would slide away, the missile raised to the vertical, ready for fueling and launching. The Atlas ICBM had several significant operational shortcomings. It had to be fueled immediately before launch, leading to a high reaction time (about 15 minutes) after launch order. The fueling was also a very dangerous process which lead to several heavy explosions during operational tests. The radio-command-inertial guidance system of the Atlas D was susceptible to jamming and restricted the launch frequency of an Atlas D squadron to one missile every 5 minutes. The SM-65D used either Mk.2 or Mk.3 blunt reentry vehicles. There was also an unarmed training version of the SM-65D, designated USM-65D. Family: ICBM. Country: USA. Engines: XLR105-5, XLR89-5. Spacecraft: Project 7969, McDonnell Project 7969, Outpost, Project Mer, Mercury, Mercury Space Suit, FIRE, OV1. Launch Sites: Cape Canaveral, Vandenberg, Cape Canaveral LC14, Cape Canaveral LC12, Cape Canaveral LC11, Cape Canaveral LC13, Vandenberg 576A2, Vandenberg 576A3, Vandenberg 576B2, Vandenberg 576B1, Warren AFB, Vandenberg 576B3, Offutt AFB, Vandenberg 576A1. Stages: Atlas MA-2, Atlas D stage. Agency: Convair. 1956 November 16 - . Launch Site: Vandenberg. Launch Complex: Vandenberg. LV Family: Atlas. Launch Vehicle: Atlas D.
Vandenberg selected as first ICBM base. - . Nation: USA. Department of Defense transferred northern portion of Camp Cooke, Calif. (now Vandenberg AFB), to the Air Force to be used as first ICBM base. The Secretary of Defense directed the United States Army to transfer 64,000 acres of Camp Cooke's 86,000 acres to the Air Force. 1957 May 6 - . Launch Site: Warren AFB. LV Family: Atlas. Launch Vehicle: Atlas D.
Warren AFB - . The Air Force Ballistic Missile Committee approved the use of Francis E. Warren AFB, Wyoming, as the second operational prototype base in the Atlas initial operational capability (IOC) program..
1957 July 1 - . Launch Site: Vandenberg. Launch Complex: Vandenberg. LV Family: Atlas. Launch Vehicle: Atlas D.
First Atlas wing activated at Cooke AFB. - . Nation: USA. Air Research and Development Command activated the 704th Strategic Missile Wing (Atlas) at Cooke AFB..
1957 August 1 - . LV Family: Atlas. Launch Vehicle: Atlas D.
Atlas IOC delayed. - . Nation: USA. Estimated operational capability date for Atlas changed from March 1959 to June 1959..
1957 November 14 - . LV Family: Titan, Atlas. Launch Vehicle: Atlas D, Atlas E, Titan I.
USAF augmented program for ballistic missiles - . Headquarters USAF presented its revised and augmented program for ballistic missile development to the Secretary of Defense and the Armed Forces Policy Council. Nine Atlas squadrons were proposed, the first to become operational in June 1959 and the ninth in June 1963 and eight Titan squadrons, the first to be operational in March 1961 and the last in June 1963. 1957 November 21 - . Launch Site: Warren AFB. LV Family: Atlas. Launch Vehicle: Atlas D.
Warren AFB - . The Air Force announced that the first Atlas ICBM operational base and strategic missile squadron would be located at Francis E. Warren AFB, Wyoming..
1958 - During the year - . LV Family: Atlas. Launch Vehicle: Atlas D.
Outpost four-man space station. - . Nation: USA. Related Persons: Ehricke. Spacecraft: Outpost. In 1958, the year after Sputnik 1, Krafft Ehricke, then with General Dynamics' Convair Division, designed a four-man space station known as Outpost. Ehricke proposed that the Atlas ICBM being developed by Convair could be adapted as the station's basic structure. The Atlas, 3 m in diameter and 22.8 m long, was America's largest rocket at the time. 1958 May 28 - . LV Family: Atlas. Launch Vehicle: Atlas D.
Atlas production facility opens. - . Nation: USA. Open house, new Astronautics facility on Kearny Mesa. 1958 July - . LV Family: Atlas. Launch Vehicle: Atlas D.
Atlas ICBM soft pad design complete. - . Nation: USA. Design of vertical initial operational capability ground support equipment. 1958 August - . LV Family: Atlas. Launch Vehicle: Atlas D.
Scheduled design complete (95%) for Atlas D-series missiles - . Nation: USA. 1958 October 17-18 - . LV Family: Atlas. Launch Vehicle: Atlas D.
Negotiations for Mercury Atlas launch vehicles - . Nation: USA. Spacecraft: Mercury. Langley Research Center personnel visited the Air Force Ballistic Missile Division, Inglewood, California, to open negotiations for procuring Atlas launch vehicles for the manned satellite project..
1958 November 24 - . LV Family: Atlas. Launch Vehicle: Atlas D.
Space Task Group orders first Mercury Atlas missile. - . Nation: USA. Spacecraft: Mercury. The Space Task Group placed an order for one Atlas launch vehicle with the Air Force Missile Division, Inglewood, California, as part of a preliminary research program leading to manned space flight. The National Aeronautics and Space Administration Headquarters requested that the Air Force construct and launch one Atlas C launch vehicle to check the aerodynamics of the spacecraft. It was the intention to launch this missile about May 1959 in a ballistic trajectory. This was to be the launch vehicle for the Big Joe reentry test shot, but plans were later changed and an Atlas Model D launch vehicle was used instead. 1958 December 8 - . LV Family: Atlas. Launch Vehicle: Atlas D.
Nine Atlas launch vehicles ordered for Project Mercury - . Nation: USA. Spacecraft: Mercury. The Space Task Group indicated that nine Atlas launch vehicles were required in support of the Project Mercury manned and unmanned flights and these were ordered from the Air Force Ballistic Missile Division..
1959 January - . LV Family: Atlas. Launch Vehicle: Atlas D.
Strategic Air Command takes over Atlas ICBM facilities. - . Nation: USA. VAFB SMS 576A facilities turned over to SAC. 1959 February - . LV Family: Atlas. Launch Vehicle: Atlas D.
NASA/USAF responsibilities for the first two Mercury Atlas firings. - . Nation: USA. Spacecraft: Mercury. During a meeting between personnel of the Space Task Group and the Air Force Ballistic Missile Division, the responsibilities of the two organizations were outlined for the first two Atlas firings. Space Technology Laboratories, under Air Force Ballistic Missile Division direction, would select the design trajectories according to the specifications set forth by the Space Task Group. These specifications were to match a point in the trajectory at about 450,000 feet, corresponding to a normal reentry condition for the manned spacecraft after firing of the retrorockets at an altitude of 120 nautical miles. Space Technology Laboratories would also provide impact dispersion data, data for range safety purposes, and the necessary reprograming of the guidance computers. The spacecraft for the suborbital Atlas flights would be manufactured under the deriction of the Lewis Research Center, based on Space Task Group designs. Space Task Group was developing the spacecraft instrumentation, with a contingent of personnel at the Lewis Research Center. The attitude control system was being developed by Lewis. Atlas ICBM coffin launcher design completed. - . Nation: USA. Design of horizontal operational ground support equipment (coffin configuration) completed. 1959 February 12-13 - . LV Family: Atlas. Launch Vehicle: Atlas D.
Atlas launch vehicles in Project Mercury. - . Nation: USA. Spacecraft: Mercury. Discussions were held at Langley Field between the Space Task Group and the Air Force Ballistic Missile Division covering aspects of the use of Atlas launch vehicles in Project Mercury. Specifically discussed were technical details of the first Atlas test flight (Big Joe), the abort sensing capability for later flights, and overall program objectives. 1959 February 28 - . Launch Site: , Vandenberg. LV Family: Atlas. Launch Vehicle: Atlas D.
The first operational Atlas missile accepted by the Air Force - . The first operational Atlas missile, 6D, was accepted by the Air Force from Convair. Subsequently, 6D was installed in the first Atlas complex, 65-1, at Vandenberg AFB during the first week of March..
1959 Mar - . Launch Site: Warren AFB. LV Family: Atlas. Launch Vehicle: Atlas D.
Warren AFB - . Construction began on the Atlas D operational sites assigned to Francis E. Warren AFB, Wyoming, and Offutt AFB, Nebraska..
1959 April 14 - . 21:46 GMT - . Launch Site: Cape Canaveral. Launch Complex: Cape Canaveral LC13. LV Family: Atlas. Launch Vehicle: Atlas D. FAILURE: Failure. Failed Stage: 1. Research and development launch - . Nation: USA. Agency: USAF. Apogee: 1.00 km (0.60 mi). The first Atlas D model flight test missile (3D) had to be destroyed 36 seconds into flight due to a severe engine malfunction and explosions. In addition to other changes, the D series replaced the MA-1 engine package with the Rocketdyne MA-2. The booster engines in the MA-2 produced 309,000 pounds of thrust versus 300,000 pounds for the MA-1. Sustainer engine thrust remained 57,000 pounds. With verniers, total thrust for the MA-2 was 368,000 pounds compared to 357,000 for the MA-1 engine package. 1959 May 14 - . LV Family: Atlas. Launch Vehicle: Atlas D.
NASA combines Atlas booster orders - . Spacecraft: Mercury. 1959 May 19 - . 04:30 GMT - . Launch Site: Cape Canaveral. Launch Complex: Cape Canaveral LC14. LV Family: Atlas. Launch Vehicle: Atlas D. FAILURE: Failure. Failed Stage: 1. 1959 June - . LV Family: Atlas. Launch Vehicle: Atlas D.
Atlas 2D blows up. - . Nation: USA. Missile 2D blows up on Sycamore stand S-2, after a total of 1486 seconds running time. 1959 June 5 - . LV Family: Atlas. Launch Vehicle: Atlas D.
Flight instrumentation for Mercury-Atlas program. - . Nation: USA. Spacecraft: Mercury. Space Technology Laboratories and Convair completed an analysis of flight instrumentation necessary to support the Mercury-Atlas program. The primary objective of the study was to select a light-weight telemetry system. A system weighing 270 pounds was recommended, and the National Aeronautics and Space Administration concurred with the proposal. 1959 June 6 - . 17:39 GMT - . Launch Site: Cape Canaveral. Launch Complex: Cape Canaveral LC13. LV Family: Atlas. Launch Vehicle: Atlas D. FAILURE: Failure. Failed Stage: 1. Research and development launch - . Nation: USA. Agency: USAF. 1959 July 12 - . LV Family: Atlas. Launch Vehicle: Atlas D.
Instrumentation to measure noise level during the Mercury Big Joe-Atlas launching. - . Nation: USA. Spacecraft: Mercury. An agreement was made with the Air Force for Space Task Group to place microphone pickups on the skin of the Atlas launch vehicle as a part of the instrumentation to measure noise level during the Big Joe-Atlas launching. Distribution of the microphones was as follows: one inside the Mercury spacecraft, three externally about midway of the launch vehicle, and one on the Atlas skirt. 1959 July 29 - . 04:10 GMT - . Launch Site: Cape Canaveral. Launch Complex: Cape Canaveral LC11. LV Family: Atlas. Launch Vehicle: Atlas D.
Research and development test - . Nation: USA. Agency: USAF. Apogee: 1,800 km (1,100 mi). First Atlas successful D missile flight.After three consecutive failures (3D, 7D, and 5D), Atlas missile 11D became the first Series D flight test missile to complete a successful launch from Cape Canaveral..
1959 August 11 - . 18:01 GMT - . Launch Site: Cape Canaveral. Launch Complex: Cape Canaveral LC13. LV Family: Atlas. Launch Vehicle: Atlas D.
Research and development launch - . Nation: USA. Agency: USAF. Apogee: 1,800 km (1,100 mi). 1959 August 28 - . LV Family: Atlas. Launch Vehicle: Atlas D.
Additional Atlas launch vehicles in support of Project Mercury. - . Nation: USA. Spacecraft: Mercury. NASA Headquarters authorized the Space Task Group to enter into negotiations with the Air Force Ballistic Missile Division for the procurement of additional Atlas launch vehicles in support of Project Mercury. The authorization was to be incorporated into Contract No. HS-36. 1959 September 1 - . Launch Site: Vandenberg. Launch Complex: Vandenberg. LV Family: Atlas. Launch Vehicle: Atlas D.
Atlas D ICBM operational. - . Nation: USA. USAF Atlas ICBM officially declared operational and taken over by the Strategic Air Command, at Vandenberg AFB..
1959 September 9 - . 08:19 GMT - . Launch Site: Cape Canaveral. Launch Complex: Cape Canaveral LC14. LV Family: Atlas. Launch Vehicle: Atlas D. FAILURE: Failure. Failed Stage: 1. Mercury BJ-1 - . Nation: USA. Agency: USAF. Apogee: 153 km (95 mi). A NASA boilerplate model of the Mercury capsule was launched atop Atlas 10D from Cape Canaveral. Although the range was less than planned due to failure of the Atlas booster engine section to separate, the capsule was recovered in the South Atlantic after surviving reentry heat of more than 10,000°F. 1959 September 9 - . 17:50 GMT - . Launch Site: Vandenberg. Launch Complex: Vandenberg 576A2. LV Family: Atlas. Launch Vehicle: Atlas D.
Atlas ICBM initial operational capability demonstration launch - . Nation: USA. Agency: USAF SAC. Apogee: 1,800 km (1,100 mi). A SAC crew conducted the first west coast launch of an Atlas operational configuration missile, 12D, from Vandenberg AFB, to a target near Wake Island, Afterward, General Thomas S. Power, CINCSAC, declared the Atlas system to be operational. This marked the attainment of operational status for the Atlas one year earlier than the six years that the von Neumann Committee had projected in its February 1954 report. 1959 September 17 - . 02:09 GMT - . Launch Site: Cape Canaveral. Launch Complex: Cape Canaveral LC13. LV Family: Atlas. Launch Vehicle: Atlas D. FAILURE: Failure. Failed Stage: 1. Research and development launch - . Nation: USA. Agency: USAF. Apogee: 1,000 km (600 mi). 1959 October 2 - . Launch Site: Warren AFB. LV Family: Atlas. Launch Vehicle: Atlas D.
Warren AFB - . The first Atlas missile was delivered to Francis E. Warren AFB, Wyoming, and was used to check out missile installation and launch facilities..
1959 October 6 - . 05:55 GMT - . Launch Site: Cape Canaveral. Launch Complex: Cape Canaveral LC11. LV Family: Atlas. Launch Vehicle: Atlas D.
Mk 3 Mod 1 re-entry vehicle research and development mission - . Nation: USA. Agency: USAF. Apogee: 1,800 km (1,100 mi). 1959 October 10 - . 03:10 GMT - . Launch Site: Cape Canaveral. Launch Complex: Cape Canaveral LC13. LV Family: Atlas. Launch Vehicle: Atlas D.
1959 October 29 - . 07:20 GMT - . Launch Site: Cape Canaveral. Launch Complex: Cape Canaveral LC11. LV Family: Atlas. Launch Vehicle: Atlas D.
Research and development test - . Nation: USA. Agency: USAF. Apogee: 1,800 km (1,100 mi). USAF Atlas successfully launched from Cape Canaveral carrying a nose-cone camera which took a series of photographs of the earth's cloud cover from a 300-mile altitude..
1959 November 4 - . 21:37 GMT - . Launch Site: Cape Canaveral. Launch Complex: Cape Canaveral LC13. LV Family: Atlas. Launch Vehicle: Atlas D.
1959 November 24 - . 19:48 GMT - . Launch Site: Cape Canaveral. Launch Complex: Cape Canaveral LC13. LV Family: Atlas. Launch Vehicle: Atlas D.
1959 December 9 - . 00:10 GMT - . Launch Site: Cape Canaveral. Launch Complex: Cape Canaveral LC13. LV Family: Atlas. Launch Vehicle: Atlas D.
1959 December 19 - . 00:48 GMT - . Launch Site: Cape Canaveral. Launch Complex: Cape Canaveral LC13. LV Family: Atlas. Launch Vehicle: Atlas D.
Research and development test - . Nation: USA. Agency: USAF. Apogee: 1,800 km (1,100 mi). Atlas ICBM made second successful 6,325-mile flight at AMR..
1960 January 7 - . 01:40 GMT - . Launch Site: Cape Canaveral. Launch Complex: Cape Canaveral LC13. LV Family: Atlas. Launch Vehicle: Atlas D.
Research and development test - . Nation: USA. Agency: USAF. Apogee: 1,800 km (1,100 mi). 43D achieved a 6300 NM (7200 SM) flight from AMR with enough residual fuel for an additional 2000 miles. 1960 January 18 - . LV Family: Atlas. Launch Vehicle: Atlas D.
Mercury-Atlas flight test working group - . Nation: USA. Spacecraft: Mercury. A proposal was made by Walter C. Williams, Associate Director of Project Mercury Operations, that the Mercury-Atlas flight test working group become an official and standing coordination body. This group brought together representation from the Space Task Group, Air Force Ballistic Missile Division, Convair Astronautics, McDonnell Aircraft Corporation, and the Atlantic Missile Range. Personnel from these organizations had met informally in the past on several occasions. 1960 January 21 - . LV Family: Atlas. Launch Vehicle: Atlas D.
15 Atlas launch vehicles and 26 Mercury spacecraft purchased. - . Nation: USA. Spacecraft: Mercury. At a meeting to draft fiscal year 1962 funding estimates, the total purchase of Atlas launch vehicles was listed as 15, and the total purchase of Mercury spacecraft was listed as 26..
1960 January 26 - . 23:43 GMT - . Launch Site: Vandenberg. Launch Complex: Vandenberg 576A3. LV Family: Atlas. Launch Vehicle: Atlas D. FAILURE: Failure. Initial operational capability demonstration launch - . Nation: USA. Agency: USAF SAC. Apogee: 1,800 km (1,100 mi). Two Atlas ICBMs launched within two hours - one by SAC at VAFB, one by GD/A at AMR; both successful..
1960 January 27 - . 01:31 GMT - . Launch Site: Cape Canaveral. Launch Complex: Cape Canaveral LC13. LV Family: Atlas. Launch Vehicle: Atlas D.
1960 February 12 - . 04:11 GMT - . Launch Site: Cape Canaveral. Launch Complex: Cape Canaveral LC13. LV Family: Atlas. Launch Vehicle: Atlas D.
1960 Mar - . Launch Site: , Vandenberg. LV Family: Atlas. Launch Vehicle: Atlas D.
Three Atlas missiles in semi-readiness - . Three Atlas missiles were placed in semi-readiness at Vandenberg AFB..
1960 March-April - . LV Family: Atlas. Launch Vehicle: Atlas D.
Mercury-Atlas working panels - . Nation: USA. Spacecraft: Mercury. The Mercury-Atlas working panels were reorganized into four groups: coordination, flight test, trajectory analysis, and change control. Each panel was composed of at least one representative from NASA (Space Task Group), McDonnell, Air Force Ballistic Missile Division, Space Technology Laboratory, and Convair-Astronautics. 1960 March 8 - . 13:10 GMT - . Launch Site: Cape Canaveral. Launch Complex: Cape Canaveral LC11. LV Family: Atlas. Launch Vehicle: Atlas D.
Research and development test - . Nation: USA. Agency: USAF. Apogee: 1,800 km (1,100 mi). First USAF Atlas R&D flight using all-inertial guidance system..
1960 March 11 - . 00:36 GMT - . Launch Site: Cape Canaveral. Launch Complex: Cape Canaveral LC13. LV Family: Atlas. Launch Vehicle: Atlas D. FAILURE: Failure. Failed Stage: 1. 1960 March 16 - . LV Family: Atlas. Launch Vehicle: Atlas D.
Recovery requirements for Mercury MA-1. - . Nation: USA. Spacecraft: Mercury. The Space Task Group published recovery requirements for the Mercury-Atlas 1 (MA-1) flight test..
1960 April 8 - . 02:06 GMT - . Launch Site: Cape Canaveral. Launch Complex: Cape Canaveral LC11. LV Family: Atlas. Launch Vehicle: Atlas D. FAILURE: Failure. Failed Stage: 1. Research and development launch - . Nation: USA. Agency: USAF. Apogee: 1.00 km (0.60 mi). Atlas 48D, intended to be the first closed-loop test of the Arma all-inertial guidance system, exploded immediately after launch release as a result of combustion instability in the MA-2 engine..
1960 April 22 - . 19:39 GMT - . Launch Site: Vandenberg. Launch Complex: Vandenberg 576B2. LV Family: Atlas. Launch Vehicle: Atlas D.
Initial operational capability operational readiness test launch - . Nation: USA. Agency: USAF SAC. Apogee: 1,800 km (1,100 mi). SAC crews successfully fired the first Atlas missile (25D) to be launched from an operational horizontal "coffin" missile storage/launcher facility at Vandenberg AFB. .
1960 May 6 - . 16:47 GMT - . Launch Site: Vandenberg. Launch Complex: Vandenberg 576B2. LV Family: Atlas. Launch Vehicle: Atlas D. FAILURE: Failure. Failed Stage: 1. Initial operational capability operational readiness test launch - . Nation: USA. Agency: USAF SAC. Apogee: 2.00 km (1.20 mi). 1960 May 20 - . 15:00 GMT - . Launch Site: Cape Canaveral. Launch Complex: Cape Canaveral LC12. LV Family: Atlas. Launch Vehicle: Atlas D.
Research and development test - . Nation: USA. Agency: USAF. Apogee: 1,800 km (1,100 mi). Atlas 56D carried a 3,000-pound payload 7,859 nautical miles (9,040 statute miles) from Cape Canaveral to the target area in the Indian Ocean. This was the longest U.S. missile flight to date. Payload was an operational weight nose cone plus instrumentation. Missile attained an apogee of about 1,000 miles. 1960 June 11 - . 06:30 GMT - . Launch Site: Cape Canaveral. Launch Complex: Cape Canaveral LC11. LV Family: Atlas. Launch Vehicle: Atlas D.
Research and development launch - . Nation: USA. Agency: USAF. Apogee: 1,800 km (1,100 mi). Atlas flight test missile 54D completed the first successful demonstration of accuracy and reliability of the closed-loop Arma all-inertial guidance system. .
1960 June 18 - . LV Family: Atlas. Launch Vehicle: Atlas D.
Mercury MA-1 launch vehicle delivered - . Nation: USA. Spacecraft: Mercury. Atlas launch vehicle 50-D was delivered for the first Mercury-Atlas mission (MA-1)..
1960 June 22 - . 14:49 GMT - . Launch Site: Cape Canaveral. Launch Complex: Cape Canaveral LC14. LV Family: Atlas. Launch Vehicle: Atlas D. FAILURE: Electrical Failure. Research and development test - . Nation: USA. Agency: USAF. Apogee: 1,800 km (1,100 mi). 50th Atlas to be flown at AMR, successful. 1960 June 28 - . 02:30 GMT - . Launch Site: Cape Canaveral. Launch Complex: Cape Canaveral LC12. LV Family: Atlas. Launch Vehicle: Atlas D.
Research and development / ionosphere mission - . Nation: USA. Agency: USAF. Apogee: 1,800 km (1,100 mi). 1960 July 2 - . 06:58 GMT - . Launch Site: Cape Canaveral. Launch Complex: Cape Canaveral LC11. LV Family: Atlas. Launch Vehicle: Atlas D.
1960 July 11 - . LV Family: Atlas. Launch Vehicle: Atlas D.
Ballistic missile site activation moved to Air Materiel Command. - . Headquarters USAF assigned responsibility for management of all ballistic missile operational site activation work to Air Materiel Command. ARDC retained responsibility for activation of Atlas D squadrons - the 564th and 565th Strategic Missile Squadrons at F.E. Warren and the 566th at Offutt AFB - and for first-of-a-kind installations at Vandenberg AFB. Under these arrangements, AMC was to have responsibility for contractor direction and performance while AFBMD retained control of site installation design and some facets of technical engineering and configuration control. Atlas operational plans given high priority - . Nation: USA. M. Gen. Tom Gerrity appointed head of new BMC for operational site selection through turnover. 1960 July 22 - . 23:46 GMT - . Launch Site: Vandenberg. Launch Complex: Vandenberg 576B1. LV Family: Atlas. Launch Vehicle: Atlas D. FAILURE: Failure. Failed Stage: 1. Initial operational capability operational readiness test launch - . Nation: USA. Agency: USAF SAC. Apogee: 20 km (12 mi). 1960 July 29 - . 13:13 GMT - . Launch Site: Cape Canaveral. Launch Complex: Cape Canaveral LC14. LV Family: Atlas. Launch Vehicle: Atlas D. FAILURE: Structural failure of Atlas.. Failed Stage: 1. Mercury MA-1 - . Nation: USA. Agency: USAF. Spacecraft: Mercury. Apogee: 13 km (8 mi). The first Mercury-Atlas -D (MA-1) was successfully launched from Cape Canaveral to test the Mercury capsule and Atlas D booster for future use in NASA's Project Mercury manned orbital flight program. Mercury-Atlas 1 (MA-1) was launched from the Atlantic Missile Range in a test of spacecraft structural integrity under maximum heating conditions. After 58.5 seconds of flight, MA-1 exploded and the spacecraft was destroyed upon impact off-shore. None of the primary capsule test objectives were met. The mission objectives were to check the integrity of the spacecraft structure and afterbody shingles for a reentry associated with a critical abort and to evaluate the open-loop performance of the Atlas abort-sensing instrumentation system. The spacecraft contained no escape system and no test subject. Standard posigrade rockets were used to separate the spacecraft from the Atlas, but the retrorockets were dummies. The flight was terminated because of a launch vehicle and adapter structural failure. The spacecraft was destroyed upon impact with the water because the recovery system was not designed to actuate under the imposed flight conditions. Later most of the spacecraft, the booster engines, and the liquid oxygen vent valve were recovered from the ocean floor. Since none of the primary flight objectives was achieved, Mercury-Atlas 2 (MA-2) was planned to fulfill the mission. 1961 August 1960 to February - . LV Family: Atlas. Launch Vehicle: Atlas D.
1960 August 5 - . Launch Site: Warren AFB. LV Family: Atlas. Launch Vehicle: Atlas D.
Warren AFB - . Complex 564A, designed to house three Atlas D missiles in horizontal "coffin" storage/launcher facilities, was completed at Francis E. Warren AFB, Wyoming, and transferred to SAC..
1960 August 9 - . 18:09 GMT - . Launch Site: Cape Canaveral. Launch Complex: Cape Canaveral LC12. LV Family: Atlas. Launch Vehicle: Atlas D.
Research and development / aeronomy mission - . Nation: USA. Agency: USAF. Apogee: 1,800 km (1,100 mi). 1960 August 11 - . LV Family: Atlas. Launch Vehicle: Atlas D.
1960 August 12 - . 13:00 GMT - . Launch Site: Cape Canaveral. Launch Complex: Cape Canaveral LC11. LV Family: Atlas. Launch Vehicle: Atlas D.
1960 August 30 - . Launch Site: Warren AFB. LV Family: Atlas. Launch Vehicle: Atlas D.
The transfer of the three-missile Complex 564B, the first operational Atlas D (CGM-16D) squadron at Francis E. Warren AFB, Wyoming. With this the 564th Strategic Missile Squadron, was turned over to the Strategic Air Command's 706th Strategic Missile Wing. 1960 September 12 - . 20:38 GMT - . Launch Site: Vandenberg. Launch Complex: Vandenberg 576B3. LV Family: Atlas. Launch Vehicle: Atlas D. FAILURE: Failure. Failed Stage: 1. Initial operational capability demonstration and shakedown operations launch - . Nation: USA. Agency: USAF SAC. Apogee: 1,000 km (600 mi). 1960 September 17 - . 00:50 GMT - . Launch Site: Cape Canaveral. Launch Complex: Cape Canaveral LC11. LV Family: Atlas. Launch Vehicle: Atlas D.
1960 September 19 - . 18:31 GMT - . Launch Site: Cape Canaveral. Launch Complex: Cape Canaveral LC14. LV Family: Atlas. Launch Vehicle: Atlas D.
Research and development test - . Nation: USA. Agency: USAF. Apogee: 1,800 km (1,100 mi). Atlas ICBM fired 9030 statute miles, from Cape Canaveral to the Indian Ocean off the Cape of Good Hope in 50 minutes, the second record distance flight..
1960 September 20 - . LV Family: Atlas. Launch Vehicle: Atlas D.
Mercury MA-3 launch vehicle delivered - . Nation: USA. Spacecraft: Mercury. The Atlas launch vehicle 67-D was delivered to Cape Canaveral for the Mercury-Atlas 2 (MA-2) reentry test mission..
1960 September 26 - . LV Family: Atlas. Launch Vehicle: Atlas D.
Roll-out of Mercury MA-3 launch vehicle - . Nation: USA. Spacecraft: Mercury. The roll-out inspection of Mercury Atlas launch vehicle 77-D was conducted at Convair-Astronautics. This launch vehicle was allocated for the Mercury-Atlas 3 (MA-3) mission, but was later canceled and Atlas booster 100-D was used instead..
1960 September 29 - . 20:31 GMT - . Launch Site: Vandenberg. Launch Complex: Vandenberg 576B2. LV Family: Atlas. Launch Vehicle: Atlas D. FAILURE: Failure. Failed Stage: 1. Initial operational capability demonstration and shakedown operations launch - . Nation: USA. Agency: USAF SAC. Apogee: 500 km (310 mi). 1960 October 13 - . 04:53 GMT - . Launch Site: Vandenberg. Launch Complex: Vandenberg 576B3. LV Family: Atlas. Launch Vehicle: Atlas D. FAILURE: Failure. Failed Stage: 1. Initial operational capability demonstration and shakedown operations launch - . Nation: USA. Agency: USAF SAC. Apogee: 20 km (12 mi). 1960 October 13 - . 09:34 GMT - . Launch Site: Cape Canaveral. Launch Complex: Cape Canaveral LC11. LV Family: Atlas. Launch Vehicle: Atlas D.
Research and development test - . Nation: USA. Agency: USAF. Apogee: 1,800 km (1,100 mi). USAF Atlas launched at AMR placed nose cone containing three black mice 650 miles up and 5,000 miles downrange at 17,000 mph. Nose cone was recovered in target area near Ascension Island, the three mice surviving the flight in "good condition.". 1960 October 22 - . 05:13 GMT - . Launch Site: Cape Canaveral. Launch Complex: Cape Canaveral LC14. LV Family: Atlas. Launch Vehicle: Atlas D.
November 1960-August 1961 - . LV Family: Atlas. Launch Vehicle: Atlas D.
Crash program instigated to get Atlas sites operational. - . Nation: USA. Golden Ram program accomplished at SMS 576-B2 & B3. 1960 November 15 - . LV Family: Atlas. Launch Vehicle: Atlas D.
Atlas D/AIG All Inertial Guidance - . Nation: USA. Atlas D/AIG (All Inertial Guidance) scheduled design 95 % complete. 1960 November 15 - . 05:54 GMT - . Launch Site: Cape Canaveral. Launch Complex: Cape Canaveral LC12. LV Family: Atlas. Launch Vehicle: Atlas D.
1960 November 18 - . LV Family: Atlas. Launch Vehicle: Atlas D.
Mercury MA-3 spacecraft delivered - . Nation: USA. Spacecraft: Mercury. Spacecraft No. 8 was delivered to Cape Canaveral for the Mercury-Atlas 3 (MA-3) unmanned orbital mission..
1960 December 16 - . 20:35 GMT - . Launch Site: Vandenberg. Launch Complex: Vandenberg 576B3. LV Family: Atlas. Launch Vehicle: Atlas D.
Research and development launch - . Nation: USA. Agency: USAF. Apogee: 1,800 km (1,100 mi). The first ICBM operational reentry vehicle ever recovered was fished out of the Eniwetok Lagoon five days later..
1961 January 23 - . 21:02 GMT - . Launch Site: Cape Canaveral. Launch Complex: Cape Canaveral LC12. LV Family: Atlas. Launch Vehicle: Atlas D.
1961 February 17-20 - . LV Family: Atlas. Launch Vehicle: Atlas D.
Rules for the Mercury MA-2 - . Nation: USA. Spacecraft: Mercury. Spacecraft, mission, and launch vehicle flight safety rules for the Mercury-Atlas 2 (MA-2) mission were reviewed by Space Task Group personnel..
1961 February 17 - . LV Family: Atlas. Launch Vehicle: Atlas D.
1961 February 21 - . 14:12 GMT - . Launch Site: Cape Canaveral. Launch Complex: Cape Canaveral LC14. LV Family: Atlas. Launch Vehicle: Atlas D.
Mercury MA-2 - . Nation: USA. Agency: USAF. Spacecraft: Mercury. Apogee: 182 km (113 mi). Mercury-Atlas 2 (MA-2) was launched from Cape Canaveral in a test to check maximum heating and its effects during the worst reentry design conditions. The flight closely matched the desired trajectory and attained a maximum altitude of 114.04 statute miles and a range of 1,431.6 statute miles. Inspection of the spacecraft aboard the recovery ship some 55 minutes after launch (actual flight time was 17.56 minutes) indicated that test objectives were met, since the structure and heat protection elements appeared to be in excellent condition. The flight control team obtained satisfactory data; and the complete launch computing and display system, operating for the first time in a flight, performed satisfactorily. 1961 February 24 - . LV Family: Atlas. Launch Vehicle: Atlas D.
Mercury MA-5 spacecraft delivered - . Nation: USA. Spacecraft: Mercury. Spacecraft No. 9 was delivered to Cape Canaveral for the Mercury-Atlas 5 (MA-5) orbital primate (Enos) mission..
1961 March 3 - . LV Family: Atlas. Launch Vehicle: Atlas D.
Mercury MA-3 launch vehicle rolled out. - . Nation: USA. Spacecraft: Mercury. Factory roll-out inspection of Atlas launch vehicle No. 100-D was conducted at Convair-Astronautics. This launch vehicle was allocated for the Mercury-Atlas 3 (MA-3) mission..
1961 March 4 - . Launch Site: Warren AFB. LV Family: Atlas. Launch Vehicle: Atlas D.
Warren AFB - . The second Atlas D (horizontal storage/ launcher) squadron at Francis E. Warren AFB, Wyoming - the 565th Strategic Missile Squadron was transferred to SAC's 706th Strategic Missile Wing..
1961 March 14 - . LV Family: Atlas. Launch Vehicle: Atlas D.
Mercury MA-3 launch vehicle delivered - . Nation: USA. Spacecraft: Mercury. Atlas launch vehicle 100-D was delivered to Cape Canaveral for the Mercury-Atlas 3 (MA-3) mission..
1961 March 21 - . LV Family: Atlas. Launch Vehicle: Atlas D.
The Mercury-Atlas Missile Range Projects Office designated as a staff function - . Nation: USA. Spacecraft: Mercury. The Mercury-Atlas Missile Range Projects Office, headed by Elmer H. Buller, was designated as a staff function of the Space Task Group Director's office..
1961 March 30 - . Launch Site: Offutt AFB. Launch Complex: Offutt AFB. LV Family: Atlas. Launch Vehicle: Atlas D.
Atlas SMS 566 operational. - . Nation: USA. Offutt AFB SMS 566 operational. The third and last Series D Atlas complex of nine missiles was turned over to SAC's 549th Strategic Missile Squadron at Offutt AFB, Nebraska..
1961 April 25 - . 16:15 GMT - . Launch Site: Cape Canaveral. Launch Complex: Cape Canaveral LC14. LV Family: Atlas. Launch Vehicle: Atlas D. FAILURE: Destroyed by range safety.. Failed Stage: G.
Mercury MA-3 - . Payload: Mercury SC8. Mass: 1,355 kg (2,987 lb). Nation: USA. Agency: NASA. Class: Manned. Type: Manned spacecraft. Spacecraft: Mercury. Decay Date: 1961-04-25 . Mercury-Atlas 3 (MA-3) was launched from Cape Canaveral in an attempt to orbit the spacecraft with a 'mechanical astronaut' aboard. After lift-off, the launch vehicle failed to roll to a 70 degree heading and to pitch over into the proper trajectory. The abort-sensing system activated the escape rockets prior to the launch vehicle's destruction by the range safety officer after approximately 40 seconds of flight that had attained an altitude of 16,400 feet. The spacecraft then coasted up to 24,000 feet, deployed its parachutes, and landed in the Atlantic Ocean 2,000 yards north of the launch pad. The spacecraft was recovered and was found to have incurred only superficial damage; it was then shipped to McDonnell for refitting. 1961 May 11 - . LV Family: Atlas. Launch Vehicle: Atlas D.
MA-4 spacecraft delivered - . Nation: USA. Spacecraft: Mercury. Mercury spacecraft 8A was delivered to Cape Canaveral for the Mercury-Atlas 4 (MA-4) orbital unmanned (mechanical astronaut) mission..
1961 May 17 - . LV Family: Atlas. Launch Vehicle: Atlas D.
Mercury MA-3 investigation board - . Nation: USA. Spacecraft: Mercury. An Atlas investigation board was convened to study the cause of the Mercury-Atlas 3 (MA-3) mission launch vehicle failure. Several possible areas were considered, and three were isolated as probable causes based on a review of test data..
1961 May 24 - . 21:50 GMT - . Launch Site: Vandenberg. Launch Complex: Vandenberg 576B2. LV Family: Atlas. Launch Vehicle: Atlas D.
1961 May 29 - . LV Family: Atlas. Launch Vehicle: Atlas D.
Centrifuge training for Mercury-Atlas orbital missions. - . Nation: USA. Spacecraft: Mercury. A 30 day centrifuge training program was conducted at the Aviation Medical Acceleration Laboratory directed entirely toward training the astronauts for the Mercury-Atlas orbital missions..
1961 June 1 - . LV Family: Atlas. Launch Vehicle: Atlas D.
Prelaunch mission rules for MA-4 published. - . Nation: USA. Spacecraft: Mercury. 1961 June 8 - . LV Family: Atlas. Launch Vehicle: Atlas D.
Mercury-Atlas 4 (MA-4) recovery requirements were published. - . Nation: USA. Spacecraft: Mercury. 1961 June 29-30 - . LV Family: Atlas. Launch Vehicle: Atlas D.
MA-4 vehicle roll-out - . Nation: USA. Spacecraft: Mercury. Factory roll-out inspection of Atlas launch vehicle 88-D, designated for the Mercury-Atlas 4 (MA-4) mission, was conducted at Convair..
1961 July 15 - . LV Family: Atlas. Launch Vehicle: Atlas D.
Mercury Atlas launch vehicle 88-D delivered to Cape Canaveral - . Nation: USA. Spacecraft: Mercury. Atlas launch vehicle 88-D was delivered to Cape Canaveral for the Mercury-Atlas 4 (MA-4) mission..
1961 August 9 - . LV Family: Atlas. Launch Vehicle: Atlas D.
Key personnel operational assignments for the Mercury MA-4 - . Nation: USA. Spacecraft: Mercury. Key personnel operational assignments for the Mercury-Atlas 4 (MA-4) unmanned orbital mission were made by the Space Task Group..
Retrofire-from-orbit mission rules for Mercury MA-4 - . Nation: USA. Spacecraft: Mercury, Mercury Retrorockets. Retrofire-from-orbit mission rules were published for the unmanned Mercury-Atlas 4 (MA-4) orbital flight..
1961 August 23 - . 01:16 GMT - . Launch Site: Vandenberg. Launch Complex: Vandenberg 576B3. LV Family: Atlas. Launch Vehicle: Atlas D.
The launch of Atlas 101D from Vandenberg AFB completed the initial operational capability (IOC) launch series for the Atlas D ICBM. In 11 launches, only five missiles were successful. The launch of Atlas 101D from Vandenberg AFB completed the initial operational capability (IOC) launch series for the Atlas D ICBM. In 11 launches, only five missiles were successful. 1961 August 24 - . LV Family: Atlas. Launch Vehicle: Atlas D.
Mercury-Atlas 4 (MA-4) unmanned orbital flight postponed. - . Nation: USA. Spacecraft: Mercury. 1961 September 13 - . 14:04 GMT - . Launch Site: Cape Canaveral. Launch Complex: Cape Canaveral LC14. LV Family: Atlas. Launch Vehicle: Atlas D.
Mercury MA-4 - . Payload: Mercury SC8A. Mass: 1,200 kg (2,600 lb). Nation: USA. Agency: NASA. Class: Manned. Type: Manned spacecraft. Spacecraft: Mercury. Decay Date: 1961-09-13 . USAF Sat Cat: 183 . COSPAR: 1961-A-Alpha-1. Apogee: 248 km (154 mi). Perigee: 156 km (96 mi). Inclination: 32.80 deg. Period: 88.40 min. Mercury-Atlas 4 (MA-4) was launched from Cape Canaveral with special vibration and noise instrumentation and a mechanical crewman simulator aboard in addition to the normal spacecraft equipment. This was the first Mercury spacecraft to attain an earth orbit. The orbital apogee was 123 nautical miles and the perigee was 86 nautical miles. After one orbit, the spacecraft's orbital timing device triggered the retrograde rockets, and the spacecraft splashed in the Atlantic Ocean 161 miles east of Bermuda. Recovery was made by the USS Decatur. During the flight, only three slight deviations were noted - a small leak in the oxygen system; loss of voice contact over Australia; and the failure of an inverter in the environmental control system. Overall, the flight was highly successful: the Atlas booster performed well and demonstrated that it was ready for the manned flight, the spacecraft systems operated well, and the Mercury global tracking network and telemetry operated in an excellent manner and was ready to support manned orbital flight. 1961 September 18 - . LV Family: Atlas. Launch Vehicle: Atlas D.
Mission rules for the Mercury-Atlas 5 (MA-5) orbital flight. - . Nation: USA. Spacecraft: Mercury. Mission rules for the Mercury-Atlas 5 (MA-5) orbital flight were published. Revisions were issued on October 16 and 25, 1961, and November 11, 1961..
1961 October 1 - . LV Family: Atlas. Launch Vehicle: Atlas D.
Factory roll-out inspection of Mercury Atlas booster No. 93-D - . Nation: USA. Spacecraft: Mercury. Factory roll-out inspection of Atlas booster No. 93-D was conducted at Convair. This booster was designated for the Mercury-Atlas 5 (MA-5) mission..
1961 October 9 - . LV Family: Atlas. Launch Vehicle: Atlas D.
Mercury Atlas booster No. 93-D delivered to Cape Canaveral - . Nation: USA. Spacecraft: Mercury. Atlas booster No. 93-D was delivered to Cape Canaveral for the Mercury-Atlas 5 (MA-5) orbital flight mission..
1961 November 12 - . LV Family: Atlas. Launch Vehicle: Atlas D.
Mercury 5 launch postponed - . Nation: USA. Class: Manned. Type: Manned spacecraft. Spacecraft: Mercury. Mercury-Atlas 5, scheduled for launch no earlier than November 14, ran into technical difficulties, postponing launch for several days..
1961 November 29 - . 15:07 GMT - . Launch Site: Cape Canaveral. Launch Complex: Cape Canaveral LC14. LV Family: Atlas. Launch Vehicle: Atlas D.
Mercury MA-5 - . Payload: Mercury SC9. Mass: 1,300 kg (2,800 lb). Nation: USA. Agency: NASA. Class: Manned. Type: Manned spacecraft. Spacecraft: Mercury. Decay Date: 1961-11-29 . USAF Sat Cat: 208 . COSPAR: 1961-A-Iota-1. Apogee: 237 km (147 mi). Perigee: 158 km (98 mi). Inclination: 32.60 deg. Period: 88.30 min. Atlas D (53D) was the first missile to be launched by SAC from Vandenberg in the operation test (Category III) launch program. Mercury-Atlas 5 (MA-5), the second and final orbital qualification of the spacecraft prior to manned flight was launched from Cape Canaveral with Enos, a 37.5 pound chimpanzee, aboard. Scheduled for three orbits, the spacecraft was returned to earth after two orbits due to the failure of a roll reaction jet and to the overheating of an inverter in the electrical system. Both of these difficulties could have been corrected had an astronaut been aboard. The spacecraft was recovered 255 miles southeast of Bermuda by the USS Stormes. During the flight, the chimpanzee performed psychomotor duties and upon recovery was found to be in excellent physical condition. The flight was termed highly successful and the Mercury spacecraft well qualified to support manned orbital flight. 1961 November 29 - . 23:01 GMT - . Launch Site: Vandenberg. Launch Complex: Vandenberg 576B2. LV Family: Atlas. Launch Vehicle: Atlas D.
Operational missile test - . Nation: USA. Agency: USAF SAC. Apogee: 1,800 km (1,100 mi). Atlas D (53D) was the first missile to be launched by SAC from Vandenberg in the operation test (Category III) launch program. .
1961 November 30 - . LV Family: Atlas. Launch Vehicle: Atlas D.
Mercury Atlas launch vehicle 109-D delivered to Cape Canaveral - . Nation: USA. Spacecraft: Mercury. Atlas launch vehicle 109-D was delivered to Cape Canaveral for the Mercury-Atlas 6 (MA-6) first manned orbital mission..
1961 December 7 - . 21:18 GMT - . Launch Site: Vandenberg. Launch Complex: Vandenberg 576B3. LV Family: Atlas. Launch Vehicle: Atlas D.
Operational missile test - . Nation: USA. Agency: USAF SAC. Apogee: 1,800 km (1,100 mi). 1962 January 15-17 - . LV Family: Atlas. Launch Vehicle: Atlas D.
Recovery swimmers trained for Mercury MA-6. - . Nation: USA. Spacecraft: Mercury. Recovery area swimmers were trained at the Pensacola Naval Air Station, Florida, for use in the Mercury-Atlas 6 (MA-6) manned orbital mission. Instruction included films, briefings, auxiliary flotation collar deployment, and jumps from a helicopter..
1962 January 16 - . LV Family: Atlas. Launch Vehicle: Atlas D.
Mercury spacecraft 16 delivered to Cape Canaveral - . Nation: USA. Spacecraft: Mercury. Spacecraft 16 was delivered to Cape Canaveral for the third manned (Schirra) orbital flight, Mercury-Atlas 8 (MA-8)..
1962 January 17 - . 21:02 GMT - . Launch Site: Vandenberg. Launch Complex: Vandenberg 576B2. LV Family: Atlas. Launch Vehicle: Atlas D.
1962 January 23 - . 21:28 GMT - . Launch Site: Vandenberg. Launch Complex: Vandenberg 576B3. LV Family: Atlas. Launch Vehicle: Atlas D.
1962 January 27 - . LV Family: Atlas. Launch Vehicle: Atlas D.
Mercury MA-6 postponed at T-minus 29 minutes - . Nation: USA. Spacecraft: Mercury. The Mercury-Atlas 6 (MA-6) manned orbital flight was postponed at T-minus 29 minutes due to weather conditions..
1962 January 30 - . LV Family: Atlas. Launch Vehicle: Atlas D.
Mercury MA-6 postponed - . Nation: USA. Spacecraft: Mercury. The Mercury-Atlas 6 (MA-6) mission was postponed because of technical difficulties with the launch vehicle..
1962 February 14 - . LV Family: Atlas. Launch Vehicle: Atlas D.
Mercury MA-6 postponed. - . Nation: USA. Spacecraft: Mercury. Unfavorable weather conditions caused the Mercury-Atlas 6 (MA-6) manned orbital mission to be postponed..
1962 February 16 - . 23:04 GMT - . Launch Site: Vandenberg. Launch Complex: Vandenberg 576B2. LV Family: Atlas. Launch Vehicle: Atlas D.
1962 February 18 - . LV Family: Atlas. Launch Vehicle: Atlas D.
NASA announced Project Fire - . Nation: USA. Program: Apollo. Spacecraft Bus: Apollo CSM. Spacecraft: FIRE. NASA announced Project Fire, a high-speed reentry heat research program to obtain data on materials, heating rates, and radio signal attenuation on spacecraft reentering the atmosphere at speeds of about 24,500 miles per hour. Information from the program would support technology for manned and unmanned reentry from lunar missions. Under the management of the Langley Research Center, Project Fire would use Atlas D boosters and the reentry package would be powered by an Antares solid-fuel motor (third stage of the Scout). 1962 February 20 - . 14:47 GMT - . Launch Site: Cape Canaveral. Launch Complex: Cape Canaveral LC14. LV Family: Atlas. Launch Vehicle: Atlas D.
Mercury MA-6 - . Call Sign: Friendship 7. Crew: Glenn. Backup Crew: Carpenter. Payload: Mercury SC13. Mass: 1,355 kg (2,987 lb). Nation: USA. Agency: NASA. Class: Manned. Type: Manned spacecraft. Flight: Mercury MA-6. Spacecraft: Mercury. Duration: 0.21 days. Decay Date: 1962-02-20 . USAF Sat Cat: 240 . COSPAR: 1962-Gamma-1. Apogee: 265 km (164 mi). Perigee: 159 km (98 mi). Inclination: 32.50 deg. Period: 88.60 min. The 6555th Aerospace Test Wing launched the Mercury/Atlas D (MA-6), "Friendship 7," that placed the Mercury capsule containing LtColonel John Glenn, USMC, into orbit for the first Project Mercury manned orbital flight. "Friendship 7" completed three orbits before successful reentry and recovery in the Atlantic Ocean. First US manned orbital mission. John Glenn finally puts America in orbit. False landing bag deploy light led to reentry being started with retropack left in place on heat shield. It turned out that indicator light was false and a spectacular reentry ensued, with glowing chunks of the retropack whizzing by the window. After four hours and 43 minutes the spacecraft reentered the atmosphere and landed at 2:43 pm EST in the planned recovery area NE of the Island of Puerto Rico. All flight objectives were achieved. Glenn was reported to be in excellent condition. Beause of failure of one of the automatic systems, the astronaut took over manual control of the spacecraft during part of the flight. With this flight, the basic objectives of Project Mercury had been achieved. 1962 February 21 - . 22:30 GMT - . Launch Site: Vandenberg. Launch Complex: Vandenberg 576B3. LV Family: Atlas. Launch Vehicle: Atlas D. FAILURE: Failure. Failed Stage: 1. 1962 February 25 - . LV Family: Atlas. Launch Vehicle: Atlas D.
Factory roll-out inspection of Mercury Atlas launch vehicle 107-D. - . Nation: USA. Flight: Mercury MA-7. Spacecraft: Mercury. Factory roll-out inspection of Atlas launch vehicle 107-D, designated for the Mercury-Atlas 7 (MA-7) manned orbital mission, was conducted at Convair..
1962 March 6 - . LV Family: Atlas. Launch Vehicle: Atlas D.
Mercury Atlas launch vehicle 107-D delivered to Cape Canaveral - . Nation: USA. Spacecraft: Mercury. Atlas launch vehicle 107-D was delivered to Cape Canaveral for the Mercury-Atlas 7 (MA-7) mission..
1962 March 15 - . LV Family: Atlas. Launch Vehicle: Atlas D.
Carpenter replaces Slayton on Mercury-Atlas 7 (MA-7) - . Nation: USA. Flight: Mercury MA-7. Spacecraft: Mercury. NASA Headquarters publicly announced that Scott Carpenter would pilot the Mercury-Atlas 7 (MA-7) manned orbital mission replacing Donald Slayton. The latter, formerly scheduled for the flight, was disqualified because of a minor erratic heart rate..
1962 March 24 - . 00:39 GMT - . Launch Site: Vandenberg. Launch Complex: Vandenberg 576B2. LV Family: Atlas. Launch Vehicle: Atlas D.
Demonstration and shakedown operations launch - . Nation: USA. Agency: USAF SAC. Apogee: 1,800 km (1,100 mi). An Air Force crew launched Atlas 134D during the visit of President John F. Kennedy to Cape Canaveral. This was the first time that a President had witnessed a live ICBM launch. President John F. Kennedy visited Vandenberg AFB and witnessed the launch of Atlas 134D. 1962 April - . LV Family: Atlas. Launch Vehicle: Atlas D.
Crash program completed to clear Atlas configuration problems. - . Nation: USA. Golden Ram follow-on completed at all Atlas D operational bases. 1962 April 6 - . LV Family: Atlas. Launch Vehicle: Atlas D.
Symposium on the results of Mercury MA-6 - . Nation: USA. Spacecraft: Mercury. NASA sponsored a 1-day symposium in Washington on the results of the Mercury-Atlas 6 (MA-6) three-orbit flight of John Glenn. One of the items of particular interest was Glenn's 'fire-flies,' or luminous particles, and their possible origin..
1962 April 12 - . 01:57 GMT - . Launch Site: Vandenberg. Launch Complex: Vandenberg 576B2. LV Family: Atlas. Launch Vehicle: Atlas D.
1962 April 27 - . 23:24 GMT - . Launch Site: Vandenberg. Launch Complex: Vandenberg 576B2. LV Family: Atlas. Launch Vehicle: Atlas D.
1962 April 30 - . LV Family: Atlas. Launch Vehicle: Atlas D.
Swimmer training for Mercury MA-7 - . Nation: USA. Spacecraft: Mercury. Swimmer training was started for the Mercury-Atlas 7 (MA-7) manned orbital mission recovery area. Instruction consisted of films, briefings, exercises in deploying the auxiliary flotation collar, and jumps from a helicopter..
1962 May 12 - . 00:31 GMT - . Launch Site: Vandenberg. Launch Complex: Vandenberg 576B3. LV Family: Atlas. Launch Vehicle: Atlas D.
1962 May 24 - . 12:45 GMT - . Launch Site: Cape Canaveral. Launch Complex: Cape Canaveral LC14. LV Family: Atlas. Launch Vehicle: Atlas D.
Mercury MA-7 - . Call Sign: Aurora 7. Crew: Carpenter. Backup Crew: Schirra. Payload: Mercury SC18. Mass: 1,349 kg (2,974 lb). Nation: USA. Agency: NASA. Class: Manned. Type: Manned spacecraft. Flight: Mercury MA-7. Spacecraft: Mercury. Duration: 0.21 days. Decay Date: 1962-05-24 . USAF Sat Cat: 295 . COSPAR: 1962-Tau-1. Apogee: 260 km (160 mi). Perigee: 154 km (95 mi). Inclination: 32.50 deg. Period: 88.50 min. BSD's 6555th Aerospace Test Wing launched Mercury/Atlas 7 (MA-7), "Aurora 7", into orbit carrying Navy Commander M. Scott Carpenter. This was the second U.S. manned orbital flight mission. Scott Carpenter in Aurora 7 is enthralled by his environment but uses too much orientation fuel. Yaw error and late retrofire caused the landing impact point to be over 300 km beyond the intended area and beyond radio range of the recovery forces. Landing occurred 4 hours and 56 minutes after liftoff. Astronaut Carpenter was later picked up safely by a helicopter after a long wait in the ocean and fears for his safety. NASA was not impressed and Carpenter left the agency soon thereafter to become an aquanaut. 1962 June 26 - . 10:57 GMT - . Launch Site: Vandenberg. Launch Complex: Vandenberg 576B3. LV Family: Atlas. Launch Vehicle: Atlas D.
NTMP K-1 Target mission - . Nation: USA. Agency: USAF SAC. Apogee: 1,800 km (1,100 mi). K-1 Nike-Zeus intercept of Atlas ICBM. First launch of an Atlas from Vandenberg AFB as a target for an Army Nike-Zeus from Kwajalein..
1962 July 12 - . 16:57 GMT - . Launch Site: Vandenberg. Launch Complex: Vandenberg 576B2. LV Family: Atlas. Launch Vehicle: Atlas D.
1962 July 19 - . 11:05 GMT - . Launch Site: Vandenberg. Launch Complex: Vandenberg 576B1. LV Family: Atlas. Launch Vehicle: Atlas D.
NTMP K-2 Target mission - . Nation: USA. Agency: USAF SAC. Apogee: 1,800 km (1,100 mi). K-2 Nike-Zeus intercept of Atlas ICBM. Date differs in records..
1962 July 27 - . LV Family: Atlas. Launch Vehicle: Atlas D.
Mercury Atlas launch vehicle No. 113-D accepted - . Nation: USA. Spacecraft: Mercury. Atlas launch vehicle No. 113-D was inspected at Convair and accepted for the Mercury-Atlas 8 (MA-8) manned orbital mission..
1962 August 8 - . LV Family: Atlas. Launch Vehicle: Atlas D.
Mercury Atlas launch vehicle 113-D delivered to Cape Canaveral - . Nation: USA. Spacecraft: Mercury. Atlas launch vehicle 113-D was delivered to Cape Canaveral for the Mercury-Atlas 8 (MA-8) manned orbital mission..
1962 August 9 - . 22:51 GMT - . Launch Site: Vandenberg. Launch Complex: Vandenberg 576B3. LV Family: Atlas. Launch Vehicle: Atlas D.
1962 August 9 - . 23:05 GMT - . Launch Site: Vandenberg. Launch Complex: Vandenberg 576B2. LV Family: Atlas. Launch Vehicle: Atlas D.
1962 September 8 - . LV Family: Atlas. Launch Vehicle: Atlas D.
Mercury Atlas vehicle 113-D static-fired - . Nation: USA. Spacecraft: Mercury. Atlas launch vehicle 113-D for the Mercury-Atlas 8 (MA-8) manned orbital mission was static-fired at Cape Canaveral. This test was conducted to check modifications that had been made to the booster for the purpose of smoother engine combustion..
1962 October 2 - . 11:46 GMT - . Launch Site: Vandenberg. Launch Complex: Vandenberg 576B2. LV Family: Atlas. Launch Vehicle: Atlas D. FAILURE: Failure. Failed Stage: 1. NTMP K-3 Target mission - . Nation: USA. Agency: USAF SAC. Apogee: 500 km (310 mi). 1962 October 3 - . 12:15 GMT - . Launch Site: Cape Canaveral. Launch Complex: Cape Canaveral LC14. LV Family: Atlas. Launch Vehicle: Atlas D.
Mercury MA-8 - . Call Sign: Sigma 7. Crew: Schirra. Backup Crew: Cooper. Payload: Mercury SC16. Mass: 1,374 kg (3,029 lb). Nation: USA. Agency: NASA. Class: Manned. Type: Manned spacecraft. Flight: Mercury MA-8. Spacecraft: Mercury. Duration: 0.38 days. Decay Date: 1962-10-03 . USAF Sat Cat: 433 . COSPAR: 1962-B-Delta-1. Apogee: 285 km (177 mi). Perigee: 153 km (95 mi). Inclination: 32.50 deg. Period: 88.80 min. The Sigma 7 spacecraft with Astronaut Walter M. Schirra, Jr., as pilot was launched into orbit by a Mercury-Atlas vehicle from Atlantic Missile Range. In the most successful American manned space flight to date, Schirra traveled nearly six orbits, returning to earth at a predetermined point in the Pacific Ocean 9 hours, 13 minutes after liftoff. Within 40 minutes after landing, he and his spacecraft were safely aboard the aircraft carrier U.S.S. Kearsarge . Schirra attempted and achieved a nearly perfect mission by sticking rigorously to mission plan. 1962 October 7 - . LV Family: Atlas. Launch Vehicle: Atlas D.
The Mercury-Atlas 8 (MA-8) press conference was held at the Rice University, Houston, Texas. - . Nation: USA. Related Persons: Schirra. Spacecraft: Mercury. Astronaut Schirra expressed his belief that the spacecraft was ready for the 1-day mission, that he experienced absolutely no difficulties with his better than 9 hours of weightlessness, and that the flight was of the 'textbook' variety..
1962 October 9 - . LV Family: Atlas. Launch Vehicle: Atlas D.
Mercury spacecraft 20 delivered to Cape Canaveral - . Nation: USA. Flight: Mercury MA-9. Spacecraft: Mercury. Spacecraft 20 was delivered to Cape Canaveral for the Mercury-Atlas 9 (MA-9) 1-day mission flight..
1962 October 26 - . 10:59 GMT - . Launch Site: Vandenberg. Launch Complex: Vandenberg 576A1. LV Family: Atlas. Launch Vehicle: Atlas D.
NTMP K-5 / Pod 20 Target - . Nation: USA. Agency: USAF AFSC. Apogee: 1,800 km (1,100 mi). Atlas 159D was launched from Vandenberg AFB carrying the first payload in the Ballistic Systems Division's Nike Targets program in support of the Army's Nike-X anti-ballistic missile development effort. .
1962 November 13 - . LV Family: Atlas. Launch Vehicle: Atlas D.
Cooper named for Mercury MA-9 1-day orbital mission - . Nation: USA. Related Persons: Cooper, Shepard. Flight: Mercury MA-9. Spacecraft: Mercury. Gordon Cooper was named as the pilot for Mercury-Atlas 9 (MA-9) 1-day orbital mission slated for April 1963. Alan Shepard, pilot of Mercury-Redstone 3 (MR-3) was designated as backup pilot..
1962 November 16 - . LV Family: Atlas. Launch Vehicle: Atlas D.
Mercury spacecraft 15A delivered to Cape Canaveral - . Nation: USA. Flight: Mercury MA-10. Spacecraft: Mercury. Mercury spacecraft 15A was delivered to Cape Canaveral for the Mercury-Atlas 10 (MA-10) orbital manned 1-day mission..
1962 November 28 - . LV Family: Atlas. Launch Vehicle: Atlas D.
Mercury Simulator 2 modified to the 1-day configuration. - . Nation: USA. Flight: Mercury MA-9. Spacecraft: Mercury. Mercury Simulator 2 was modified to the 1-day Mercury orbital configuration in preparation for the Mercury-Atlas 9 (MA-9) flight..
Retrofire initiated 2 seconds late during Mercury MA-8 - . Nation: USA. Spacecraft: Mercury. Retrofire was reported to have initiated 2 seconds late during the Mercury-Atlas 8 (MA-8) mission. Because of this, the mechanics and tolerances of the Mercury orbital timing device were reviewed for the benefit of operational personnel, and the procedural sequence for Mercury retrofire initiation was outlined. By the end of 1962 - . LV Family: Atlas. Launch Vehicle: Atlas D.
Mercury MA-9A (cancelled) - . Call Sign: Faith 7. Crew: Cooper. Backup Crew: Shepard. Payload: Mercury SC19. Nation: USA. Related Persons: Kennedy. Flight: Mercury MA-9A. Spacecraft: Mercury. NASA's Mercury orbital operations plan of July 19, 1961 had four spacecraft equipped for three-orbit flights. However by Schirra's flight the seven-astronaut corps was down to four. So even thought the flight-ready SC19 had been delivered to Cape Canaveral on March 20, 1962, the decision was taken to cancel the remaining short-duration mission and move directly to an 18 orbit mission. 1962 December 12 - . 11:38 GMT - . Launch Site: Vandenberg. Launch Complex: Vandenberg 576A3. LV Family: Atlas. Launch Vehicle: Atlas D.
NTMP K-6 Target mission - . Nation: USA. Agency: USAF AFSC. Apogee: 1,800 km (1,100 mi). K-6 Nike-Zeus intercept of Atlas ICBM..
1962 December 22 - . 09:29 GMT - . Launch Site: Vandenberg. Launch Complex: Vandenberg 576A1. LV Family: Atlas. Launch Vehicle: Atlas D.
NTMP K-7 / Pod 4 ABM sensor test / plume characterization mission - . Nation: USA. Agency: USAF SAC. Apogee: 2,259 km (1,403 mi). K-7 Nike-Zeus intercept of Atlas ICBM..
1963 January 3 - . LV Family: Atlas. Launch Vehicle: Atlas D.
Mercury MA-9 flight to go 22 orbits. - . Nation: USA. Spacecraft: Mercury. Tentative plans were made by NASA to extend the Mercury-Atlas 9 (MA-9) flight from 18 to 22 orbits..
1963 January 25 - . 10:44 GMT - . Launch Site: Vandenberg. Launch Complex: Vandenberg 576B2. LV Family: Atlas. Launch Vehicle: Atlas D. FAILURE: Failure. Failed Stage: 1. NTMP K-9/OT ABM test - . Nation: USA. Agency: USAF SAC. Apogee: 100 km (60 mi). 1963 January 31 - . 08:51 GMT - . Launch Site: Vandenberg. Launch Complex: Vandenberg 576A3. LV Family: Atlas. Launch Vehicle: Atlas D.
NTMP K-12 ABM test - . Nation: USA. Agency: USAF SAC. Apogee: 1,800 km (1,100 mi). 1963 February 12 - . LV Family: Atlas. Launch Vehicle: Atlas D.
The Manned Spacecraft Center announced a mid-May flight for Mercury-Atlas 9 (MA-9). - . Nation: USA. Flight: Mercury MA-9. Spacecraft: Mercury. Originally scheduled for April, the launch date was delayed by a decision to rewire the Mercury-Atlas flight control system, as a result of the launch vehicle checkout at the plant inspection meeting..
1963 February 13 - . 11:55 GMT - . Launch Site: Vandenberg. Launch Complex: Vandenberg 576A1. LV Family: Atlas. Launch Vehicle: Atlas D.
NTMP K-8 / NC20.133 ABM test - . Nation: USA. Agency: USAF SAC. Apogee: 1,800 km (1,100 mi). K-8 Nike-Zeus intercept of Atlas ICBM..
1963 February 28 - . 09:02 GMT - . Launch Site: Vandenberg. Launch Complex: Vandenberg 576A3. LV Family: Atlas. Launch Vehicle: Atlas D.
NTMP K-10 ABM test - . Nation: USA. Agency: USAF SAC. Apogee: 1,800 km (1,100 mi). K-10 Nike-Zeus intercept of Atlas ICBM..
1963 March 10 - . 02:42 GMT - . Launch Site: Vandenberg. Launch Complex: Vandenberg 576B3. LV Family: Atlas. Launch Vehicle: Atlas D. FAILURE: Failure. Failed Stage: 1. Operational missile test - . Nation: USA. Agency: USAF SAC. Apogee: 0 km (0 mi). 1963 March 12 - . 05:21 GMT - . Launch Site: Vandenberg. Launch Complex: Vandenberg 576B2. LV Family: Atlas. Launch Vehicle: Atlas D.
1963 March 15 - . 11:38 GMT - . Launch Site: Vandenberg. Launch Complex: Vandenberg 576B1. LV Family: Atlas. Launch Vehicle: Atlas D. FAILURE: Failure. Failed Stage: 1. TALL TREE 1 operational test launch - . Nation: USA. Agency: USAF SAC. Apogee: 300 km (180 mi). 1963 March 16 - . 08:32 GMT - . Launch Site: Vandenberg. Launch Complex: Vandenberg 576A1. LV Family: Atlas. Launch Vehicle: Atlas D. FAILURE: Failure. Failed Stage: 1. NTMP K-14/NC20.145 Target/Aeronomy mission - . Nation: USA. Agency: USAF SAC. Apogee: 300 km (180 mi). 1963 April 22 - . LV Family: Atlas. Launch Vehicle: Atlas D.
Mercury Spacecraft 20 mated to Atlas launch vehicle - . Nation: USA. Flight: Mercury MA-9. Spacecraft: Mercury. Spacecraft 20 was moved from Hanger S at Cape Canaveral to Complex 14 and mated to Atlas launch vehicle 130-D in preparation for the Mercury-Atlas 9 (MA-9) mission. The first simulated flight test was begun immediately..
1963 April 30 - . LV Family: Atlas. Launch Vehicle: Atlas D.
1963 May 15 - . 13:04 GMT - . Launch Site: Cape Canaveral. Launch Complex: Cape Canaveral LC14. LV Family: Atlas. Launch Vehicle: Atlas D.
Mercury MA-9 - . Call Sign: Faith 7. Crew: Cooper. Backup Crew: Shepard. Payload: Mercury SC20. Mass: 1,376 kg (3,033 lb). Nation: USA. Agency: NASA Houston. Class: Manned. Type: Manned spacecraft. Flight: Mercury MA-9. Spacecraft: Mercury. Duration: 1.43 days. Decay Date: 1963-05-16 . USAF Sat Cat: 576 . COSPAR: 1963-015A. Apogee: 265 km (164 mi). Perigee: 163 km (101 mi). Inclination: 32.50 deg. Period: 88.70 min. Final Mercury mission, Faith 7 , was piloted by Astronaut L. Gordon Cooper, Jr..
1963 June 8 - . LV Family: Atlas. Launch Vehicle: Atlas D.
Mercury MA-10 environmental control system changes - . Nation: USA. Flight: Mercury MA-10. Spacecraft: Mercury, Mercury ECS. In preparation for the Mercury-Atlas 10 (MA-10) mission, should the flight be approved by NASA Headquarters, several environmental control system changes were made in spacecraft 15B. Particularly involved were improvements in the hardware and flexibility of the urine and condensate systems. With regard to the condensate portion, Gordon Cooper, in his press conference, indicated that the system was not easy to operate during the flight of Faith 7 (MA-9). 1963 June 12 - . 09:03 GMT - . Launch Site: Vandenberg. Launch Complex: Vandenberg 576A3. LV Family: Atlas. 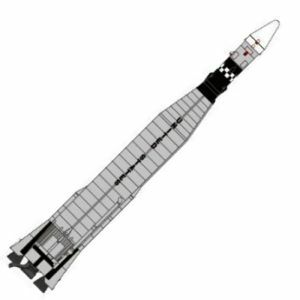 Launch Vehicle: Atlas D.
NTMP K-15 Atlas intercept - . Nation: USA. Agency: USAF SAC. Apogee: 1,800 km (1,100 mi). K-15 Nike-Zeus intercept of Atlas ICBM..
1963 July 31 - . 20:52 GMT - . Launch Site: Vandenberg. Launch Complex: Vandenberg 576B1. LV Family: Atlas. Launch Vehicle: Atlas D.
ST COOL WATER I test - . Nation: USA. Agency: USAF SAC. Apogee: 1,000 km (600 mi). 1963 August 28 - . 23:10 GMT - . Launch Site: Vandenberg. Launch Complex: Vandenberg 576B3. LV Family: Atlas. Launch Vehicle: Atlas D.
ST COOL WATER II test - . Nation: USA. Agency: USAF SAC. Apogee: 1,800 km (1,100 mi). 1963 September 6 - . 21:59 GMT - . Launch Site: Vandenberg. Launch Complex: Vandenberg 576B2. LV Family: Atlas. Launch Vehicle: Atlas D. FAILURE: Failure. Failed Stage: 1. ST COOL WATER III test - . Nation: USA. Agency: USAF SAC. Apogee: 200 km (120 mi). 1963 September 11 - . 21:00 GMT - . Launch Site: Vandenberg. Launch Complex: Vandenberg 576B1. LV Family: Atlas. Launch Vehicle: Atlas D. FAILURE: Failure. Failed Stage: 1. ST COOL WATER IV test - . Nation: USA. Agency: USAF SAC. Apogee: 1,700 km (1,000 mi). 1963 October - . LV Family: Atlas. Launch Vehicle: Atlas D.
Mercury MA-10 (cancelled) - . Call Sign: Freedom 7 II. Crew: Shepard. Backup Crew: Cooper. Payload: Mercury SC15B. Nation: USA. Flight: Mercury MA-10. Spacecraft: Mercury. Alan Shepard, and others pushed for a six day Mercury 10 endurance mission. This would give America the manned space endurance record for the first time and also cover the biological objectives of the first two Gemini missions. The Mercury 15B capsule had already been modified for long-duration flight and Shepard had the name 'Freedom 7 II' painted on the side. But the risk and work pending on Gemini persuaded NASA managers not to undertake another mission. 1963 October 7 - . 21:31 GMT - . Launch Site: Vandenberg. Launch Complex: Vandenberg 576B3. LV Family: Atlas. Launch Vehicle: Atlas D. FAILURE: Failure. Failed Stage: 1. ST COOL WATER V test - . Nation: USA. Agency: USAF SAC. Apogee: 10 km (6 mi). By the end of 1963 - . LV Family: Atlas. Launch Vehicle: Atlas D.
Mercury MA-11 (cancelled) - . Crew: Grissom. Backup Crew: Schirra. Payload: Mercury SC12B. Nation: USA. Flight: Mercury MA-11. Spacecraft: Mercury. From October 25, 1961 until April 1962 NASA's Mercury program plan included four one-day flights in 1963. By October 1962 the decision had been quietly taken to limit the long-duration flights to only MA-9 and MA-10. MA-10 was fnally cancelled in turn after the successful MA-9 mission. 1963 November 4 - . 09:34 GMT - . Launch Site: Vandenberg. Launch Complex: Vandenberg 576A1. LV Family: Atlas. Launch Vehicle: Atlas D.
ABRES REX-III re-entry vehicle test flight - . Nation: USA. Agency: USAF SAC. Spacecraft: ABRES. Apogee: 1,800 km (1,100 mi). The first Advanced Ballistic Reentry System (ABRES) program launch from Vandenberg was successfully completed when SAC's Atlas D booster (232D) carried the Chrysler-built REX-3 reentry vehicle down the Pacific Missile Range. .
1963 November 13 - . 22:35 GMT - . Launch Site: Vandenberg. Launch Complex: Vandenberg 576B2. LV Family: Atlas. Launch Vehicle: Atlas D. FAILURE: Failure. Failed Stage: 1. ST COOL WATER VI test - . Nation: USA. Agency: USAF SAC. Apogee: 100 km (60 mi). SAC launched Atlas D (158) in the final Atlas D operational program launch from Vandenberg. The missile was a failure, making the final tally for the 26 launches nine failures and 17 successes. .
Mercury MA-12 (cancelled) - . Crew: Schirra. Payload: Mercury SC17. Nation: USA. Related Persons: Schirra. Flight: Mercury MA-12. Spacecraft: Mercury. 1963 December 18 - . 09:52 GMT - . Launch Site: Vandenberg. Launch Complex: Vandenberg 576A1. LV Family: Atlas. Launch Vehicle: Atlas D.
ABRES LORV-8 re-entry vehicle test flight - . Nation: USA. Agency: USAF SAC. Spacecraft: ABRES. Apogee: 1,800 km (1,100 mi). Atlas 109F was the final Atlas research and development flight test missile to be launched. Since the first attempted launch of a Series A Atlas on 11 June 1957, 95 Atlas missiles had been used in the R&D program - eight As, nine Bs, six Cs, 32 Ds, 24 Es, and 16 Fs. All but 12 of these were launched from Cape Canaveral. Of the 95 launches, 57 were considered successful while 38 were failures. 1964 April 14 - . 21:42 GMT - . Launch Site: Cape Canaveral. Launch Complex: Cape Canaveral LC12. LV Family: Atlas. Launch Vehicle: Atlas D.
FIRE 1 - . Nation: USA. Agency: NASA. Apogee: 837 km (520 mi). FIRE was a subscale model of the Apollo capsule used to verify the spacecraft's hypersonic flight and thermal characteristics. An Atlas D launch vehicle lifted a Project Fire spacecraft from Cape Kennedy in the first test of the heat that would be encountered by a spacecraft reentering the atmosphere at lunar-return velocity. During the spacecraft's fall toward earth, a solid-fuel Antares II rocket behind the payload fired for 30 seconds, increasing the descent speed to 40,501 kilometers (25,166 miles) per hour. Instruments in the spacecraft radioed temperature data to the ground. The spacecraft exterior reached an estimated temperature of 11,400 K (20,000 degrees F). About 32 minutes after launch, the spacecraft impacted into the Atlantic Ocean. The mission, sponsored by Langley Research Center, provided reentry heating measurements needed to evaluate heatshield materials and information on the communications blackout during reentry. 1964 June 18 - . 14:56 GMT - . Launch Site: Vandenberg. Launch Complex: Vandenberg 576A1. LV Family: Atlas. Launch Vehicle: Atlas D.
ABRES LORV-1 / Pod 31 Re-entry vehicle test - . Nation: USA. Agency: USAF SAC. Spacecraft: ABRES. Apogee: 1,800 km (1,100 mi). 1964 July 29 - . 09:22 GMT - . Launch Site: Vandenberg. Launch Complex: Vandenberg 576A3. LV Family: Atlas. Launch Vehicle: Atlas D.
NTMP KX-13 Target mission - . Nation: USA. Agency: USAF SAC. Apogee: 1,800 km (1,100 mi). 1964 September - . LV Family: Atlas. Launch Vehicle: Atlas D.
Atlas SMS 564 deactivated. - . Nation: USA. Warren-1 AFB SMS 564 deactivated. 1964 September 1 - . Launch Site: Warren AFB. LV Family: Atlas. Launch Vehicle: Atlas D.
Warren AFB - . The first Atlas D squadron, the 564th Strategic Missile Squadron at Francis E. Warren AFB, Wyoming, was inactivated..
1964 September 15 - . 15:27 GMT - . Launch Site: Vandenberg. Launch Complex: Vandenberg 576A1. LV Family: Atlas. Launch Vehicle: Atlas D.
ABRES LORV-3 / Pod 26 Re-entry vehicle test - . Nation: USA. Agency: USAF SAC. Spacecraft: ABRES. Apogee: 1,800 km (1,100 mi). 1964 September 22 - . 13:10 GMT - . Launch Site: Vandenberg. Launch Complex: Vandenberg 576A3. LV Family: Atlas. Launch Vehicle: Atlas D.
NTMP KX-19 Target mission - . Nation: USA. Agency: USAF SAC. Apogee: 1,800 km (1,100 mi). 1964 December - . LV Family: Atlas. Launch Vehicle: Atlas D.
Atlas SMS 565 deactivated. - . Nation: USA. Warren-2 AFB SMS 565 deactivated. 1964 December 1 - . Launch Site: Warren AFB. LV Family: Atlas. Launch Vehicle: Atlas D.
Warren AFB - . The 565th Strategic Missile Squadron (Atlas D) of SAC's 389th Strategic Missile Wing at Francis E. Warren AFB, Wyoming, was inactivated..
1964 December 1 - . 08:45 GMT - . Launch Site: Vandenberg. Launch Complex: Vandenberg 576A1. LV Family: Atlas. Launch Vehicle: Atlas D.
ABRES LORV-5 re-entry vehicle test flight - . Nation: USA. Agency: USAF SAC. Spacecraft: ABRES. Apogee: 1,800 km (1,100 mi). 1964 December 4 - . 11:09 GMT - . Launch Site: Vandenberg. Launch Complex: Vandenberg 576A3. LV Family: Atlas. Launch Vehicle: Atlas D.
NTMP RMV-303 Target mission - . Nation: USA. Agency: USAF SAC. Apogee: 1,800 km (1,100 mi). 1964 December 15 - . LV Family: Atlas. Launch Vehicle: Atlas D.
Atlas SMS 566 deactivated. - . Nation: USA. Offutt AFB SMS 566 deactivated. 1965 January 12 - . 14:32 GMT - . Launch Site: Vandenberg. Launch Complex: Vandenberg 576B1. LV Family: Atlas. Launch Vehicle: Atlas D.
NTMP RMV-302 Target mission - . Nation: USA. Agency: USAF SAC. Apogee: 1,800 km (1,100 mi). 1965 January 21 - . 21:34 GMT - . Launch Site: Vandenberg. Launch Complex: Vandenberg 576B3. LV Family: Atlas. Launch Vehicle: Atlas D. FAILURE: Failure. Failed Stage: 1. OV1-01 - . Payload: ABRES MTV-1. Mass: 85 kg (187 lb). Nation: USA. Agency: USAF. Class: Earth. Type: Magnetosphere satellite. Spacecraft: OV1. Decay Date: 1965-01-21 . Failure..
OV1-1 - . Payload: OV1-1. Mass: 555 kg (1,223 lb). Nation: USA. Agency: USAF SAC. Spacecraft: OV1. 1965 February 27 - . 11:11 GMT - . Launch Site: Vandenberg. Launch Complex: Vandenberg 576A1. LV Family: Atlas. Launch Vehicle: Atlas D.
ABRES LORV-4 re-entry vehicle test flight - . Nation: USA. Agency: USAF SAC. Spacecraft: ABRES. Apogee: 1,800 km (1,100 mi). 1965 March 2 - . 09:52 GMT - . Launch Site: Vandenberg. Launch Complex: Vandenberg 576A3. LV Family: Atlas. Launch Vehicle: Atlas D.
NTMP RMV-301 Target mission - . Nation: USA. Agency: USAF SAC. Apogee: 1,800 km (1,100 mi). 1965 March 12 - . 23:21 GMT - . Launch Site: Vandenberg. Launch Complex: Vandenberg 576B3. LV Family: Atlas. Launch Vehicle: Atlas D.
ABRES MTV-2 re-entry vehicle test flight - . Nation: USA. Agency: USAF SAC. Spacecraft: ABRES. Apogee: 1,800 km (1,100 mi). 1965 March 26 - . 09:01 GMT - . Launch Site: Vandenberg. Launch Complex: Vandenberg 576A1. LV Family: Atlas. Launch Vehicle: Atlas D.
ABRES LORV-7 re-entry vehicle test flight - . Nation: USA. Agency: USAF AFSC. Spacecraft: ABRES. Apogee: 1,800 km (1,100 mi). 1965 April 6 - . 13:34 GMT - . Launch Site: Vandenberg. Launch Complex: Vandenberg 576B1. LV Family: Atlas. Launch Vehicle: Atlas D.
ABRES WAC-4 re-entry vehicle test flight - . Nation: USA. Agency: USAF AFSC. Spacecraft: ABRES. Apogee: 1,800 km (1,100 mi). 1965 May 22 - . 21:55 GMT - . Launch Site: Cape Canaveral. Launch Complex: Cape Canaveral LC12. LV Family: Atlas. Launch Vehicle: Atlas D.
FIRE 2 - . Nation: USA. Agency: USAF. Apogee: 817 km (507 mi). Suborbital reentry heating experiment using the FIRE subscale Apollo capsule. An Atlas D booster propelled the instrumented probe, called a "flying thermometer," into a ballistic trajectory over 805 km (500 mi) high. After 26 minutes of flight, when the spacecraft began its descent, a solid-fueled Antares rocket accelerated its fall. The probe entered the atmosphere at a speed of 40,877 km (25,400 mph) and generated temperatures of about 11,206K (20,000 degrees F). Data on heating were transmitted to ground stations throughout the descent. Thirty-two minutes after the launch - and but six minutes after the Antares was fired - the device impacted in the Atlantic about 8,256 km (5,130 mi) southeast of the Cape. 1965 May 28 - . 02:54 GMT - . Launch Site: Vandenberg. Launch Complex: Vandenberg 576B3. LV Family: Atlas. Launch Vehicle: Atlas D. FAILURE: Failure.. Failed Stage: 1. OV1-03 - . Mass: 555 kg (1,223 lb). Nation: USA. Agency: USAF AFSC. Class: Earth. Type: Magnetosphere satellite. Spacecraft: OV1. Decay Date: 1965-05-28 . 1965 June 3 - . 10:38 GMT - . Launch Site: Vandenberg. Launch Complex: Vandenberg 576B2. LV Family: Atlas. Launch Vehicle: Atlas D.
NTMP RMV-304 re-entry vehicle test flight - . Nation: USA. Agency: USAF AFSC. Apogee: 1,800 km (1,100 mi). 1965 June 8 - . 15:17 GMT - . Launch Site: Vandenberg. Launch Complex: Vandenberg 576A1. LV Family: Atlas. Launch Vehicle: Atlas D.
ABRES LORV-6 re-entry vehicle test flight - . Nation: USA. Agency: USAF AFSC. Spacecraft: ABRES. Apogee: 1,800 km (1,100 mi). 1965 June 10 - . 12:26 GMT - . Launch Site: Vandenberg. Launch Complex: Vandenberg 576A3. LV Family: Atlas. Launch Vehicle: Atlas D.
NTMP RMV-303 re-entry vehicle test flight - . Nation: USA. Agency: USAF AFSC. Apogee: 1,800 km (1,100 mi). 1965 July 1 - . 09:54 GMT - . Launch Site: Vandenberg. Launch Complex: Vandenberg 576B1. LV Family: Atlas. Launch Vehicle: Atlas D.
NTMP KX-32 re-entry vehicle test flight - . Nation: USA. Agency: USAF AFSC. Apogee: 1,800 km (1,100 mi). 1965 August 4 - . 12:43 GMT - . Launch Site: Vandenberg. Launch Complex: Vandenberg 576B1. LV Family: Atlas. Launch Vehicle: Atlas D.
ABRES WAC-5 re-entry vehicle test flight - . Nation: USA. Agency: USAF AFSC. Spacecraft: ABRES. Apogee: 1,800 km (1,100 mi). 1965 August 26 - . 11:20 GMT - . Launch Site: Vandenberg. Launch Complex: Vandenberg 576B2. LV Family: Atlas. Launch Vehicle: Atlas D.
NTMP KX-41 re-entry vehicle test flight - . Nation: USA. Agency: USAF AFSC. Apogee: 1,800 km (1,100 mi). 1965 September 29 - . 10:40 GMT - . Launch Site: Vandenberg. Launch Complex: Vandenberg 576B1. LV Family: Atlas. Launch Vehicle: Atlas D.
NTMP KX-45 re-entry vehicle test flight - . Nation: USA. Agency: USAF AFSC. Apogee: 1,800 km (1,100 mi). 1965 October 5 - . 09:07 GMT - . Launch Site: Vandenberg. Launch Complex: Vandenberg 576B3. LV Family: Atlas. Launch Vehicle: Atlas D.
OV1-02 - . Payload: OV1 Dummy. Mass: 86 kg (189 lb). Nation: USA. Agency: USAF OAR. Class: Earth. Type: Magnetosphere satellite. Spacecraft: OV1. USAF Sat Cat: 1613 . COSPAR: 1965-078A. Apogee: 2,735 km (1,699 mi). Perigee: 408 km (253 mi). Inclination: 144.20 deg. Period: 117.60 min. Radiation data. Space craft engaged in investigation of spaceflight techniques and technology (US Cat A). .
OV1-02S - . Mass: 555 kg (1,223 lb). Nation: USA. Agency: USAF AFSC. Class: Earth. Type: Magnetosphere satellite. Spacecraft: OV1. COSPAR: 1965-078xx. Apogee: 2,418 km (1,502 mi). Perigee: 401 km (249 mi). Inclination: 144.20 deg. Period: 114.00 min. NB20.170 - . Payload: SPP 29. Mass: 555 kg (1,223 lb). Nation: USA. Agency: USAF AFSC. Spacecraft: OV1. COSPAR: 1965-078xx. Apogee: 2,418 km (1,502 mi). Perigee: 401 km (249 mi). Inclination: 144.20 deg. Period: 114.00 min. 1965 November 29 - . 14:30 GMT - . Launch Site: Vandenberg. Launch Complex: Vandenberg 576A1. LV Family: Atlas. Launch Vehicle: Atlas D.
NTMP KX-33 re-entry vehicle test flight - . Nation: USA. Agency: USAF AFSC. Apogee: 1,800 km (1,100 mi). 1965 December 20 - . 13:39 GMT - . Launch Site: Vandenberg. Launch Complex: Vandenberg 576B2. LV Family: Atlas. Launch Vehicle: Atlas D.
NTMP KX-31 re-entry vehicle test flight - . Nation: USA. Agency: USAF AFSC. Apogee: 1,800 km (1,100 mi). 1966 February 10 - . 09:48 GMT - . Launch Site: Vandenberg. Launch Complex: Vandenberg 576A1. LV Family: Atlas. Launch Vehicle: Atlas D.
NTMP KX-38 / Pod 32 Reentry test / plume mission - . Nation: USA. Agency: USAF AFSC. Apogee: 1,800 km (1,100 mi). 1966 February 11 - . 13:04 GMT - . Launch Site: Vandenberg. Launch Complex: Vandenberg 576B2. LV Family: Atlas. Launch Vehicle: Atlas D.
NTMP KX-51 re-entry vehicle test flight - . Nation: USA. Agency: USAF AFSC. Apogee: 1,800 km (1,100 mi). 1966 February 19 - . 09:56 GMT - . Launch Site: Vandenberg. Launch Complex: Vandenberg 576B1. LV Family: Atlas. Launch Vehicle: Atlas D.
NTMP KX-47 Re-entry Vehicle test - . Nation: USA. Agency: USAF AFSC. Apogee: 1,800 km (1,100 mi). 1966 March 4 - . 12:29 GMT - . Launch Site: Vandenberg. Launch Complex: Vandenberg 576A1. LV Family: Atlas. Launch Vehicle: Atlas D. FAILURE: Failure. Failed Stage: 1. NTMP KX-35 re-entry vehicle test flight - . Nation: USA. Agency: USAF AFSC. Apogee: 500 km (310 mi). 1966 March 19 - . 12:30 GMT - . Launch Site: Vandenberg. Launch Complex: Vandenberg 576A1. LV Family: Atlas. Launch Vehicle: Atlas D.
NTMP KX-43 re-entry vehicle test flight - . Nation: USA. Agency: USAF AFSC. Apogee: 1,800 km (1,100 mi). 1966 March 30 - . 09:20 GMT - . Launch Site: Vandenberg. Launch Complex: Vandenberg 576B3. LV Family: Atlas. Launch Vehicle: Atlas D.
OV1-04 - . Mass: 88 kg (194 lb). Nation: USA. Agency: USAF OAR. Class: Earth. Type: Magnetosphere satellite. Spacecraft: OV1. USAF Sat Cat: 2121 . COSPAR: 1966-025A. Apogee: 1,008 km (626 mi). Perigee: 884 km (549 mi). Inclination: 144.50 deg. Period: 104.00 min. Thermal control experiments. Space craft engaged in investigation of spaceflight techniques and technology (US Cat A). .
OV1-04S - . Mass: 555 kg (1,223 lb). Nation: USA. Agency: USAF AFSC. Class: Earth. Type: Magnetosphere satellite. Spacecraft: OV1. COSPAR: 1966-025xx. Apogee: 1,002 km (622 mi). Perigee: 879 km (546 mi). Inclination: 144.50 deg. Period: 103.80 min. OV1-05S - . Payload: BORE. Mass: 114 kg (251 lb). Nation: USA. Agency: USAF OAR. Class: Earth. Type: Magnetosphere satellite. Spacecraft: OV1. USAF Sat Cat: 2122 . COSPAR: 1966-025B. Apogee: 1,056 km (656 mi). Perigee: 985 km (612 mi). Inclination: 144.60 deg. Period: 105.60 min. Optical radiation test. Space craft engaged in investigation of spaceflight techniques and technology (US Cat A). .
1966 May 3 - . 10:30 GMT - . Launch Site: Vandenberg. Launch Complex: Vandenberg 576A1. LV Family: Atlas. Launch Vehicle: Atlas D. FAILURE: Failure. Failed Stage: 1. NTMP KX-37 re-entry vehicle test flight - . Nation: USA. Agency: USAF AFSC. Apogee: 500 km (310 mi). 1966 May 13 - . 11:43 GMT - . Launch Site: Vandenberg. Launch Complex: Vandenberg 576B1. LV Family: Atlas. Launch Vehicle: Atlas D.
ABRES WAC-5A re-entry vehicle test flight - . Nation: USA. Agency: USAF AFSC. Spacecraft: ABRES. Apogee: 1,800 km (1,100 mi). 1966 May 26 - . 12:04 GMT - . Launch Site: Vandenberg. Launch Complex: Vandenberg 576B2. LV Family: Atlas. Launch Vehicle: Atlas D.
1966 June 10 - . 11:15 GMT - . Launch Site: Vandenberg. Launch Complex: Vandenberg 576B1. LV Family: Atlas. Launch Vehicle: Atlas D.
NTMP KX-42 re-entry vehicle test flight - . Nation: USA. Agency: USAF AFSC. Apogee: 1,800 km (1,100 mi). 1966 June 26 - . 15:34 GMT - . Launch Site: Vandenberg. Launch Complex: Vandenberg 576B2. LV Family: Atlas. Launch Vehicle: Atlas D.
NTMP KX-20 re-entry vehicle test flight - . Nation: USA. Agency: USAF AFSC. Apogee: 1,800 km (1,100 mi). 1966 June 30 - . 10:00 GMT - . Launch Site: Vandenberg. Launch Complex: Vandenberg 576A1. LV Family: Atlas. Launch Vehicle: Atlas D.
NTMP KX-39 re-entry vehicle test flight - . Nation: USA. Agency: USAF AFSC. Apogee: 1,800 km (1,100 mi). 1966 July 14 - . 02:10 GMT - . Launch Site: Vandenberg. Launch Complex: Vandenberg 576B3. LV Family: Atlas. Launch Vehicle: Atlas D. FAILURE: Partial Failure.. Failed Stage: 1. OV1-07 - . Payload: PasComSat. Mass: 10 kg (22 lb). Nation: USA. Agency: USAF OAR. Class: Earth. Type: Magnetosphere satellite. Spacecraft: OV1. Decay Date: 1978-01-04 . USAF Sat Cat: 2324 . COSPAR: 1966-063A. Apogee: 1,022 km (635 mi). Perigee: 985 km (612 mi). Inclination: 144.20 deg. Period: 105.20 min. Space craft engaged in investigation of spaceflight techniques and technology (US Cat A). .
OV1-08 PasComSat - . Mass: 555 kg (1,223 lb). Nation: USA. Agency: USAF AFSC. Class: Earth. Type: Magnetosphere satellite. Spacecraft: OV1. Decay Date: 1978-01-04 . USAF Sat Cat: 2324 . COSPAR: 1966-063xx. Apogee: 410 km (250 mi). Perigee: 393 km (244 mi). Inclination: 144.20 deg. Period: 92.60 min. 1966 December 11 - . 21:09 GMT - . Launch Site: Vandenberg. Launch Complex: Vandenberg 576B3. LV Family: Atlas. Launch Vehicle: Atlas D.
OV1-09 - . Mass: 230 kg (500 lb). Nation: USA. Agency: USAF OAR. Class: Earth. Type: Magnetosphere satellite. Spacecraft: OV1. USAF Sat Cat: 2610 . COSPAR: 1966-111A. Apogee: 4,582 km (2,847 mi). Perigee: 475 km (295 mi). Inclination: 99.10 deg. Period: 139.40 min. Radiation bio-hazard experiments. Space craft engaged in investigation of spaceflight techniques and technology (US Cat A). .
OV1-10 - . Mass: 130 kg (280 lb). Nation: USA. Agency: USAF OAR. Class: Earth. Type: Magnetosphere satellite. Spacecraft: OV1. Decay Date: 2002-11-30 . USAF Sat Cat: 2611 . COSPAR: 1966-111B. Apogee: 604 km (375 mi). Perigee: 541 km (336 mi). Inclination: 93.40 deg. Period: 96.10 min. Radiation data. Space craft engaged in investigation of spaceflight techniques and technology (US Cat A). .
1967 January 22 - . 15:44 GMT - . Launch Site: Vandenberg. Launch Complex: Vandenberg 576B2. LV Family: Atlas. Launch Vehicle: Atlas D.
ABRES Mk 12R PDV re-entry vehicle test flight - . Nation: USA. Agency: USAF AFSC. Spacecraft: ABRES. Apogee: 1,800 km (1,100 mi). 1967 April 7 - . 11:19 GMT - . Launch Site: Vandenberg. Launch Complex: Vandenberg 576B2. LV Family: Atlas. Launch Vehicle: Atlas D.
ABRES AX-1 / Pod 30 Reentry test / ionosphere mission - . Nation: USA. Agency: USAF AFSC. Spacecraft: ABRES. Apogee: 1,800 km (1,100 mi). 1967 July 6 - . Launch Site: Vandenberg. Launch Complex: Vandenberg 576B2. LV Family: Atlas. Launch Vehicle: Atlas D.
ABRES PDV re-entry vehicle test flight - . Nation: USA. Agency: USAF AFSC. Spacecraft: ABRES. Apogee: 1,800 km (1,100 mi). 1967 July 27 - . 19:00 GMT - . Launch Site: Vandenberg. Launch Complex: Vandenberg 576B3. LV Family: Atlas. Launch Vehicle: Atlas D. FAILURE: Partial Failure.. Failed Stage: 1. OV1-08S - . Mass: 118 kg (260 lb). Nation: USA. Agency: USAF OAR. Class: Earth. Type: Magnetosphere satellite. Spacecraft: OV1. Decay Date: 1972-02-22 . USAF Sat Cat: 2893 . COSPAR: 1967-072A. Apogee: 557 km (346 mi). Perigee: 529 km (328 mi). Inclination: 101.60 deg. Period: 95.50 min. Carried cosmic ray telescope. Space craft engaged in investigation of spaceflight techniques and technology (US Cat A). .
OV1-11 - . Mass: 555 kg (1,223 lb). Nation: USA. Agency: USAF AFSC. Spacecraft: OV1. Decay Date: 1972-02-22 . USAF Sat Cat: 2893 . COSPAR: 1967-072xx. Apogee: 146 km (90 mi). Perigee: 144 km (89 mi). Inclination: 101.70 deg. Period: 87.40 min. OV-1 11 did not reach orbit..
OV1-12S - . Mass: 140 kg (300 lb). Nation: USA. Agency: USAF OAR. Class: Earth. Type: Magnetosphere satellite. Spacecraft: OV1. Decay Date: 1980-07-22 . USAF Sat Cat: 2901 . COSPAR: 1967-072D. Apogee: 579 km (359 mi). Perigee: 497 km (308 mi). Inclination: 101.70 deg. Period: 95.40 min. Solar flare observations. Space craft engaged in investigation of spaceflight techniques and technology (US Cat A). .
1967 October 11 - . 11:30 GMT - . Launch Site: Vandenberg. Launch Complex: Vandenberg 576B3. LV Family: Atlas. Launch Vehicle: Atlas D.
ABRES TVX-13 re-entry vehicle test flight - . Nation: USA. Agency: USAF AFSC. Spacecraft: ABRES. Apogee: 1,800 km (1,100 mi). 1967 November 7 - . 13:17 GMT - . Launch Site: Vandenberg. Launch Complex: Vandenberg 576B2. LV Family: Atlas. Launch Vehicle: Atlas D.
ABRES Mk 11 AX-2 re-entry vehicle test flight - . Nation: USA. Agency: USAF AFSC. Spacecraft: ABRES. Apogee: 1,800 km (1,100 mi). Atlas 94D was the 91st, and last, D series missile to be launched from Vandenberg AFB since 12D was launched on 9 September 1959. Final launch of an Atlas D missile (first operational at Vandenberg on 9 September 1959)..